A new covert government-trained spy-assassin was introduced in this espionage thriller - he was an Operation Outcome agent named Aaron Cross (Jeremy Renner). The film's opening image, of a body floating in ice-cold clear blue water, was an echo of the first Bourne film. A crisis was triggered when the clandestine Treadstone and the upgraded Blackbriar programs and their connection to agent Jason Bourne were about to be exposed by investigative British journalist Simon Ross (Paddy Considine), writing for The Guardian and working from leaked secret documents. The director of the CIA, Ezra Kramer (Scott Glenn) expressed his concerns to retired USN Adm. Mark Turso (Stacey Keach). In Reston, Virginia, retired Air Force Colonel Eric (or 'Ric') Byer (Edward Norton), a military insider who had headed up the earlier secret and illegal CIA programs known as Treadstone and Blackbriar, was then notified of the problem. At the National Research Assay Group (NRAG) in Washington, DC, Byer, who headed up the beta program project known as Operation Outcome, led a group of co-workers assigned to eradicate a "serious infection" (leak of information) plaguing the department and its four primary black ops programs: Treadstone, Blackbriar, Outcome, and LARX. At Waterloo Station in London, England, veteran reporter Simon Ross was assassinated. At a private research lab named Sterisyn Morlanta, bio-chemist virologists employed genetic engineering to give Operation Outcome agents enhanced capabilities with "chems." The lab was responsible for testing and medicating agents in the US Department of Defense's newer black ops program, Operation Outcome, led by Byer. Civilian biochemist Dr. Marta Shearing (Rachel Weisz) entered the Maryland facility, and began her work with colleague Dr. Donald Foite (Željko Ivanek). Outcome Agent-6 (Robert Christopher Riley) had been brought in to be tested with a full physical examination ("spec workup"). "If this Bourne mess exposes Treadstone, they will turn Hirsch inside out. They'll be talking to Hillcott before we even know what happened...We'd lose Outcome...meaning we will burn the program to the ground." Mastermind of an international espionage network, cynically-minded Byer was proposing to attempt to eradicate all evidence of Outcome, including the deaths of the nine experimental Outcome super-agents involved (including Cross). He was working with his assistant Dita Mandy (Donna Murphy). Cross traversed the rugged landscape (and crossed over a formidable mountain), arriving two days earlier than expected at an Alaskan cabin, operated by one of the other nine superagents involved in Operation Outcome. Cross met up with an exiled operative Outcome-3 (Oscar Isaac), who had been sent there as punishment for falling in love. An unmanned drone arrived to pick up Cross' blood work for analysis at the Sterisyn Morlanta lab. At the CIA's Anti-Terrorism division in NYC, head director Noah Vosen (David Strathairn) announced an "imminent threat" - what he termed "a national security emergency, priority level five." CIA agent Ray Wills (Corey Johnson) reported by phone to Byer that Jason Bourne, an agent and "international fugitive" had escaped and was alive somewhere in New York City - after gunfire and a high-speed pursuit ended at a Manhattan hospital (from the previous film). Deputy CIA director Pamela Landy (Joan Allen), turned whistleblower, was poised to reveal everything she knew to the House Intelligence Committee. Byer decided to attempt to eradicate all evidence of Outcome and its "intel-gathering assets" by shutting down Outcome immediately, and having the agents take triangular yellow pills - it was a trick to poison them. In Seoul, Korea, agent Outcome-4 (Jennifer Kim) was the first to receive the deadly new pill, followed by Outcome-1 (Adi Hanash) in Karachi, Pakistan. The first agent to die was Outcome-6 after leaving the lab, followed by Outcome-1 and Outcome-4. "We are the sin eaters. It means that we take the moral excrement we find in this equation and we bury it down deep inside of us, so that the rest of our case can stay pure. That is the job. We are morally indefensible, and absolutely necessary." Byer attempted to erase other evidence of Outcome, including its private research lab - Sterisyn Morlanta laboratories in Maryland. There, scientist Dr. Donald Foite was chemically brainwashed or hypnotized into going berserk, before he executed a half-dozen co-workers. When confronted by police officers, he committed suicide. Dr. Marta Shearing was the only survivor of the lab assault. Meanwhile, Cross stole a plane and flew out of Alaska, reappearing in Chicago in a parking garage. He retrieved stashed articles of identity (wallets, passport, license plates, etc.) for the next stage of his journey eastward - on the run. After the lab attack, as Dr. Shearing was preparing to leave town to see her sister, a group of four agents drove up to interrogate her in her secluded home in the woods, including 'clinical psychologist' Dr. Connie Dowd (Elizabeth Marvel). Without permission, Special Agent Larry Hooper (Michael Papajohn) snooped around the house, while Dr. Dowd discussed the traumatic shooting incident with Shearing. Dr. Shearing became increasingly suspicious and argumentative and demanded that they check Dr. Foite's bloodwork to determine why he became psychotic, rather than grill her or search her house. Suddenly, they fiercely attacked Shearing and were about to execute her when Cross interrupted and rescued her. Both were hunted by the feds throughout the house - they joined together to kill all of the assailants, and then after setting the house on fire, the two fled as rogue fugitives. She assumed the name June Monroe from Bethesda, Maryland, and he pretended his name was James. To his shock, Cross realized that Dr. Shearing, who had examined him 13 times over the last four years, knew him only by his code name - (Outcome) No. 5. Cross was one of the original nine Outcome agents ("program participants" chemically altered and enhanced with "chems" supplied by the Department of Defense). He and the highly-trained, genetically-modified agents, functioning as guinea pigs, were conducting intelligence operations in hostile environments. He told her that the entire program was being shut down, requiring the elimination of lab workers and everyone else associated with the program. Cross believed that he still needed to acquire a much-needed drug dosage of his "program medication" to keep his mind and body enhanced, without degrading. He believed that if he didn't take his dosage of 'chems,' all of his abilities would deteriorate. She told him that the 'live virus' to create the chems was located at a far-away site - the SteriPacific drug processing or production laboratory in Manila (the Philippines). Dr. Shearing knew that Cross had been 'viraled off' the green pills eight months earlier - that's why he wasn't feeling the effects of physical degradation ("They infected you with live virus, which means that, physically, you're stable. You don't need to take greens. They locked it in. Any physical enhancement is now permanent"). However, he still needed to be 'viraled off' the blue pills as well, with a "live culture" of "live virus." "The green side, the physical side, is nothing more than a 1.5 percent rise in your mitochondrial protein uptake. But with 1.5 percent, you see this immediate increase in cellular tempo, muscle efficiency, oxygenation..."
"The blue side, intelligence, obviously, but it's more than that. It's neural regeneration and elasticity. Sensory function. Pain suppression. It's the most exciting development in genomic targeting in the history of the science." Under the cover of Hazmet, the charred foundations of Dr. Shearing's house were investigated, and Byer learned that some of the bodies inside belonged to his D-Trac team sent to kill Shearing. An all-out pursuit was organized, when the CIA realized someone had helped Shearing escape. Cross' real name was Kenneth James Kitsom, from Reno, Nevada. Kitsom, as a Private First Class soldier, was a 26 year-old "fallen hero." He was declared dead in Operation Iraqi Freedom on November 17, 2003, after severe injuries suffered when his convoy struck a makeshift bomb in Ramadi. He was admitted to the US Army when his recruiter, to make his quota, falsified his IQ by raising it 12 points ("12 points to make the minimum"). He was admitted to Operation Outcome, where his capabilities were enhanced. He was worried about sensory withdrawal if his meds were ended. He added: "If I can't keep it together, we won't make it." Shearing and Cross prepared to travel to Manila in the Philippines. He took the identity of lab official Dr. Karl Brundage. A news report stated that Dr. Albert Hirsch died of a heart attack in his Washington DC hotel, before he was to testify before a Senate Intelligence Committee - evidence that further incriminating associations were being eliminated. The committee was about to investigate links between "a troubled CIA program known as Treadstone" and Jason Bourne (who was still the object of a search after shootings in New York and London). The latest edition of USA Today featured a picture of sole survivor Dr. Shearing, with the headline: "Researcher's troubled history clouds lab inquiry" following the shoot-out in the lab that left six dead. The two fugitives took a non-stop flight (!) (American 167) to Manila from New York's JFK, as the CIA followed all leads to intensify their pursuit of them, after a 17 hour head-start. Arriving in the evening, they were allowed clearance at the Sterisyn Morlanta lab entrance, and proceeded into Lab C. Simultaneously, the CIA discovered that Shearing was being assisted by Outcome Agent-5, taking the name of Dr. Karl Brundage, who was seeking meds ("The stems are there...she's gonna try to viral him out"). Shearing injected Cross with the live virus, just before three security officers entered. The two fled after Cross knocked out the group of officers during an escape from the lab before a lock-down was ordered by the lab's Security Manager Mackie (Shane Jacobson). The two made their way through a sea of local workers in pale pink lab coats and hats, and when confronted by Mackie, they knocked him out and Cross stole his expensive gold watch. Sickened by the viral shot, Cross and Shearing hid from the CIA in a flophouse, where Cross was eventually viraled off his blue pill medication after a day of sweats and rest. He had effectively eliminated his reliance on the agency for life-sustaining meds. The words NO MORE appeared scrawled in eyeliner on the mirror when the CIA finally located their hideout, after they had vacated. The CIA ordered pursuit by a deadly, chemically-brainwashed, Asian super-soldier named LARX-03 (Louis Ozawa Changchien), who was flown in from Bangkok. [Note: LARX was a beta-2 stem program to produce hyper-warriors: "Amped mission fidelity, minimized empathy. It's Treadstone without the inconsistency. Outcome without the emotional noise."] They evaded police and LARX-03, in a climactic chase scene, beginning with Cross fleeing across cheap, corrugated metal rooftops, followed by the two joining together on a stolen motorcycle and zig-zagging through Manila's chaotic streets. The lengthy scene after a harrowing chase ended with LARX-03 crashing a stolen police motorcycle into a warehouse concrete pillar, and the police giving up. Meanwhile, Vosen was testifying that there was a problem with Treadstone six years earlier. As a result, the Blackbriar program "was activated solely to capture a Treadstone operative gone rogue." He then admitted that he did not know Pamela Landy's reasons for criminally assisting "an enemy of the United States" (aka Jason Bourne) and testifying. He then claimed she had unauthorized access to documents that she tried to "shop to the press," although they were contained before they could do "any more harm." Cross: "No. Just looking at our options." The fourth film in the franchise - and director Tony Gilroy's fourth film (as screenwriter) as well, although his first film as director. With the tagline: "There Was Never Just One." It was not a prequel or a remake, but what was called a "side-quel" or spin-off with a new major character. Aaron Cross was another operative from the same behavioral/genetic modification program as Jason Bourne. 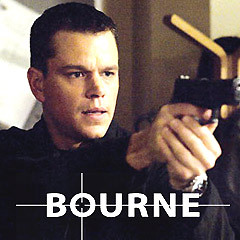 The first part of the film took place at the same time as The Bourne Ultimatum (2007). Again, the story (co-written by director Tony Gilroy) was based upon the Robert Ludlum and Eric Van Lustbader novels. Screenwriter (writer or co-writer) for the first three Bourne films, Tony Gilroy now helmed the fourth installment in the franchise, with his third feature film. The Universal film opened in late summer 2012 on August 10th. With a production budget of $125 million, and gross revenue of $113.2+ million (domestic), and $276.1+ million (worldwide). Presently, it was the longest and most expensive of the four Bourne films, and brought in the least amount of revenue. Set-pieces: The drone attack on an Alaskan cabin, the scene of Dr. Shearing's colleague Dr. Donald Foite (Zeljko Ivanek) turning berserk in the laboratory and executing his co-workers, the furious fight/shootout in Dr. Shearing's house, and the climactic chase in Manila - first on corrugated metal rooftops and then by motorcycle through the streets.